Welcome to the Westminster Manor Banquet House. I am Chef/Proprietor Daniel Lyons. I hope you find our website helpful in seeing what we have to offer you. Please review our menu selections, pricing list and view our photo gallery, below. 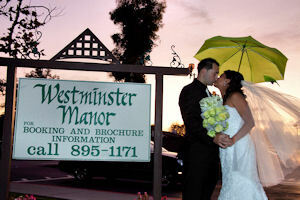 The Westminster Manor Banquet House is a charming Tudor style house displaying all the charm of the Victorian era. Beautiful English Mahogany wood graces the interior, and decorative brickwork highlights the 3 fifteen foot fireplaces located throughout the Manor. You will find three rooms inside the Manor - the club lounge area, the main formal dining room and the buffet dining room. The imported stained glass windows, and the Victorian style artwork, floral arrangements and decor all enhance the 18th century architecture of the Manor. 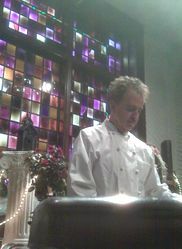 Proprietor Daniel Lyons is a Master Chef, graduating from the Culinary Institute of America in New York. After graduating from the Culinary Institute of America, Chef Daniel Lyons served his one year European apprenticeship at the Hotel Europa in Lucerne, Switzerland, Upon completion of his culinary training in Europe, Chef Daniel return to the United States and finished his 3 year American apprenticeship at the Omni International Hotel in Atlanta Georgia. He has worked as Garde Manager and Banquet/Pastry Chefs in 4 and 5 star hotels including the Hyatt Regency in Atlanta and Newport Beach. He was the opening Banquet Chef of the Ritz Carlton, Laguna Niguel. During Chef Lyons working Chef Hotel days he prepared 7 course sit down/buffet dinners for President Carter in Atlanta and President Ronald Reagan in California. In his 30 year culinary career Chef Lyons has prepared and coordinated events for such notables as Princess Grace, Peter Benchley, Charlton Heston and The "Dynasty" Set Staff. Additional culinary catering events have included the TVland Awards, MTV Music Awards and the Fox Television Network Executives Awards Night. Westminster Manor was recently the host facility for an episode of ABC's Home Improvement Show, and Chef Lyon has made several appearances on the Food Network station. Chef Lyons is pleased to offer his expertise in planning your special celebration at the Westminster Manor. To view the Westminster Manor for your upcoming event and to personally meet with Chef/Proprietor Daniel Lyons, it is best to call him at (714) 895-1171. He will schedule an appointment at your convenience. All viewings of the Manor House are done on weekends. (No viewings are done on Monday through Friday, as the Westminster Manor is used for Chef Daniel's culinary classes, seminars for wedding planners and cable television to televise these events.) Chef Daniel looks forward to hearing from you.